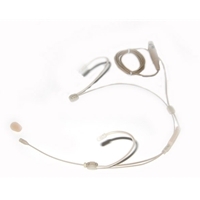 NHS-777 Discrete flesh coloured headworn mic suitable for wireless radio mic use, connector options include Sennheiser locking minijack, Shure 4pin mini xlr and AKG 3-pin minixlr, please select from the drop down menu above. Now featuring a replaceable cable, please contact us directly to purchase spare parts. These headmics are the best quality and value we've found on the market under $500, they are more robust and better quality than any of the other similarly priced ones on the market and they are less susceptible to wind noise and moisture damage than any others we have tested. There are thousands currently in use throughout NZ in churches, theatres, school and gyms and they have proved themselves to be extremely reliable even under harsh conditions. The headset mic boom arm is fully adjustable and slides right back so that the mic can be positioned right next to the ear for virtually invisible theatre use. The headset is very lightweight and comfortable, once you've had it on for a few minutes you'll forget it's there and it is very secure for when moving around in aerobics and dance situations. The small mic capsule is omnidirectional with an extremely flat freq responce from 20hz to 20khz and a sensitivity of -65dB. This headset is perfect for use in churches, schools, theatre and dance, aerobics and any general speech or singing application. The minijack version can also be plugged into most PC sound cards for computer recording.